Since the receipt of the Heritage Lottery (HLF) funding a great deal of activity has been underway to make operational the Battle of Barnet Project. 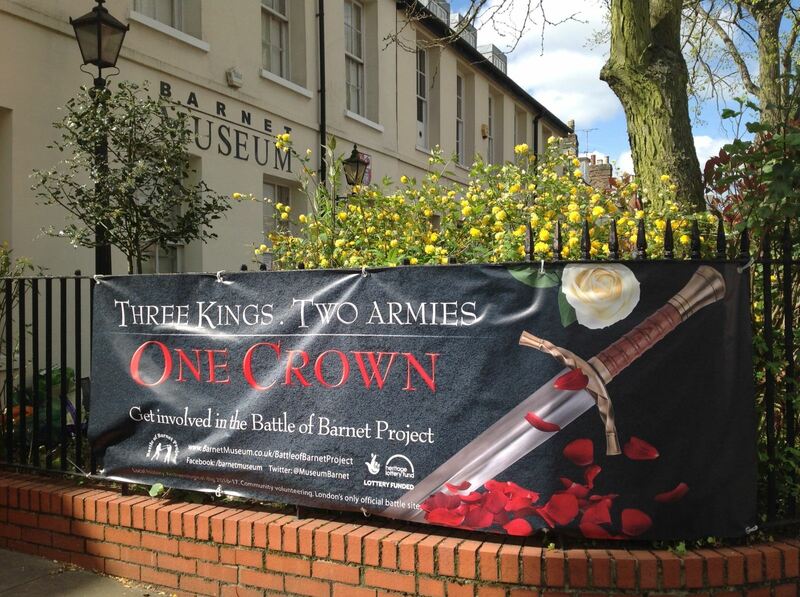 A range of activities from battlefield walks to drop in sessions at the Barnet Museum were organised for the anniversary weekend of the battle in April and planning is underway for the Barnet and the Wars of the Roses event to be held over the weekend of June 10/11th. Over the last two years with assistance from the Wars of the Roses Federation the basis for a Medieval Festival has been laid during the annual “Party in the Park” and the idea is to build on this in the years to come to create a major historical event, family entertainment and visitor attraction as well as Battle of Barnet commemoration. Recruitment for key project roles has been undertaken in the last few months and from a strong field of candidates Helen Giles was appointed as Project Co-ordinator and starts in May while Fiona Jones will be the Interpretation Planner based at the Barnet Museum. Both have extensive experience of museums and the Heritage Sector alongside working in partnerships and HLF projects and naturally both are enthusiastic about the Wars of the Roses and the Battlefields Trust! Work will also be starting on contacting the many volunteers who have expressed interest in the project so far as well as recruiting more and organising induction and training courses for the various roles. Similarly the schools programme will be getting underway shortly. Building on the success of last year a further series of Wars of the Roses talks are planned for the summer months with topics such as Clare Mulley, the Battlefields Trust poet in residence, giving a reading; Dan Spencer discussing the development and use of artillery during the Wars of the Roses; and renowned medieval artist Graham Turner talking about how he researches and depicts the battles and arms and armour of the period in his many well known paintings. Finally the finds from the archaeological work undertaken in 2015 and 2016 have been undergoing detailed examination for accurate dating and verification and this process is nearly finished. It is planned to have some of the key objects on display in Barnet Museum after Easter. Further archaeological work will be taking place later in the year. A more detailed December 2016 update on the project's archaeological work can be found HERE.